The Patent Prosecution Highway (PPH) pilot agreement program with the National Intellectual Property Administration, PRC (CNIPA) which commenced on September 1, 2013 will be extended once again on September 1, 2018 for a period of three years ending on August 31, 2021 . The latest extension also introduces the possibility for applicants to file a PCT-PPH request at CIPO, that is, to use CNIPA's international work products. CIPO and CNIPA will evaluate the results of the pilot agreement to determine whether and how the agreement should be further extended. CIPO reserves the right to limit or terminate our participation in the CIPO-CNIPA pilot agreement at any stage if the volume of participation exceeds a manageable level, or for any other reason. In the event the CIPO-CNIPA pilot agreement is terminated CIPO will provide written notice not less than three months prior to the date of termination. These requirements and procedures may be amended at any time with the consent of both offices involved. CIPO and CNIPA may, if they wish, develop office-specific guidelines, e.g. to reflect their respective legal terminology and processes, and can apply additional flexibility beyond these requirements as they see fit. An applicant should file a request for accelerated examination under the Patent Prosecution Highway (PPH) to CIPO by submitting a completed PPH request form and providing the documents required for participation in the CIPO-CNIPA PPH as noted below in Annex B. If the Examiner determines that the claims on file do not sufficiently correspond to one or more of those claims indicated as allowable by CNIPA, the applicant will be notified that the request for accelerated examination is not granted. To re-enter the PPH, the applicant must amend the claims accordingly and reapply altogether by submitting a new request form. At any time during the prosecution of a PPH application, if the Examiner determines that the claims on file do not sufficiently correspond to one or more of those claims indicated as allowable by CNIPA, the applicant will be notified that the application has been removed from the PPH and examination will proceed in a non-accelerated manner. Submit translations of any of the documents listed in points 2. or 3. above if the required work product(s) and/or claims are not available in English or French. If it is impossible for the patent examiner to understand even the outline of the translated work product(s) or the scope of the translated claims, due to inadequate translation, the examiner can request that the applicant resubmit a translation. Patent documents (where not publicly available) and non-patent literature cited by CNIPA may be provided with the request. While provision of these documents is optional, it may further accelerate examination. Applicants may file translations of citations as part of the supporting documentation when initially requesting accelerated examination under the PPH to allow prompt consideration of the citations, if they so desire. The CIPO Examiner may request translation of citations using the standard CIPO examination procedure where translation of a cited document is necessary. In addition, applicants should notify CIPO of any work products from CNIPA that are relevant to patentability which issued after submitting a PPH request, wherein CNIPA has reversed a prior indication of allowability. Further, if the work products cannot be retrieved by CIPO, they should be submitted with the notification. 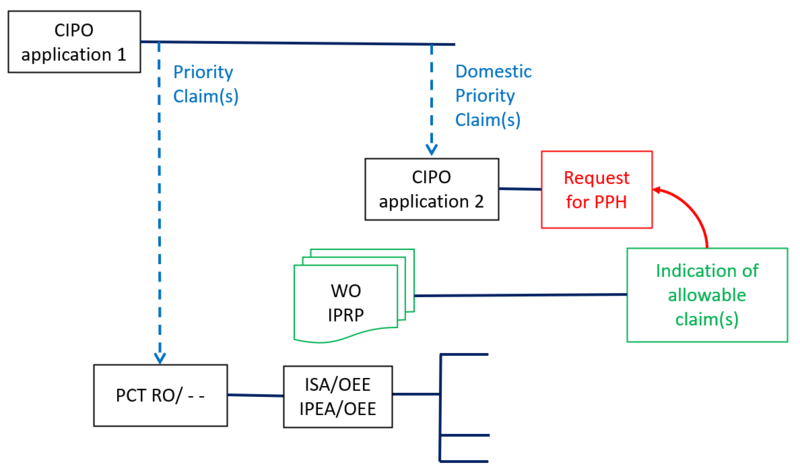 Consistent with the "MOTTAINAI" concept, PPH eligibility will be based on work available from CNIPA regardless of where the application was first filed, so long as the applications share the same effective date (priority or filing) and the disclosures support the claimed subject matter. All claims on file, as originally filed or as amended, for examination under the PPH must sufficiently correspond to one or more of those claims indicated as allowable by CNIPA. Claims are considered to sufficiently correspond where, accounting for differences due to translations and claim format, the claims before CIPO are of the same or similar scope as the claims in the corresponding application(s), or the claims before CIPO are narrower in scope than the claims in the corresponding application(s). 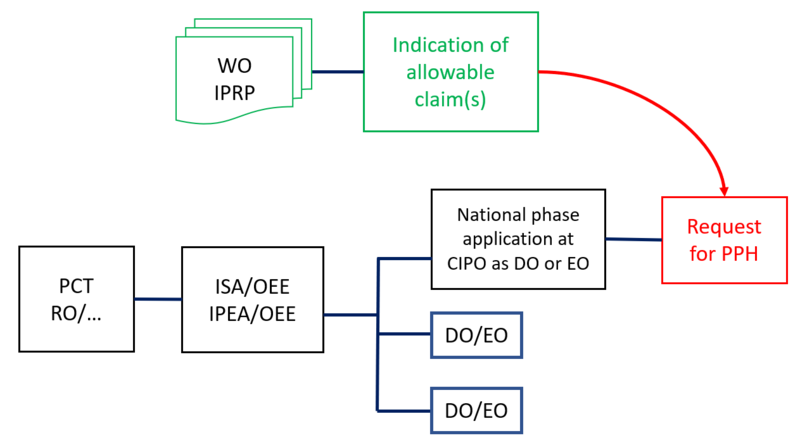 A claim before CIPO which introduces a new/different category of claims to those claims indicated as allowable by CNIPA is not considered to sufficiently correspond. 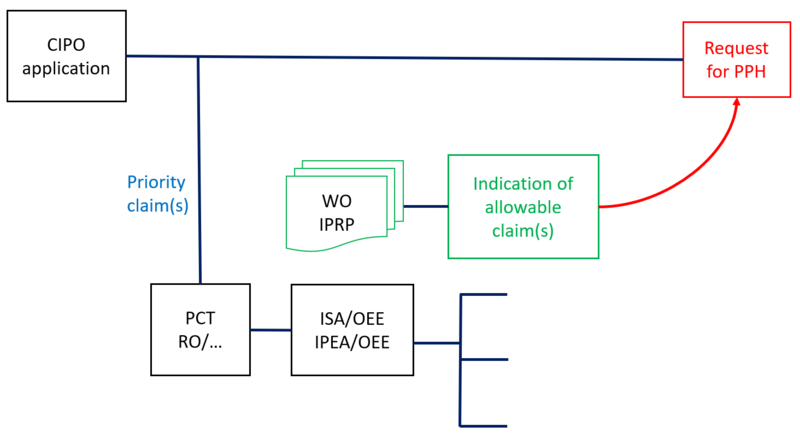 For example, where the claims in the corresponding application(s), only contain claims to a process of manufacturing a product, then the claims before CIPO are not considered to sufficiently correspond if the claims before CIPO introduce product claims that are dependent on the corresponding process claims. 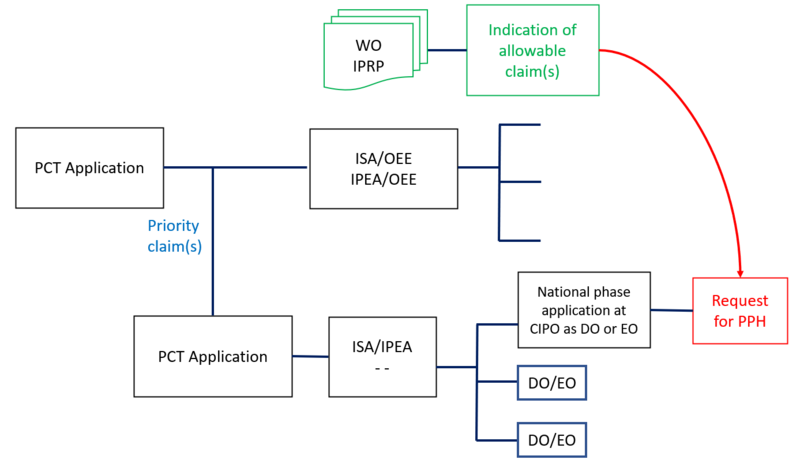 In the examples below Office of Earlier Examination (OEE) refers to CNIPA, also in its capacity as ISA and/or IPEA, the work product of which is used as a basis for the PPH request, while the Office of Later Examination (OLE) refers to CIPO as the office before which participation in the PPH pilot programme is being requested. Description of Example B A PCT international application is filed and enters national phase at CIPO. The PCT application validly claims priority from an OEE national application which has an indication of allowable subject matter or has granted as a patent. 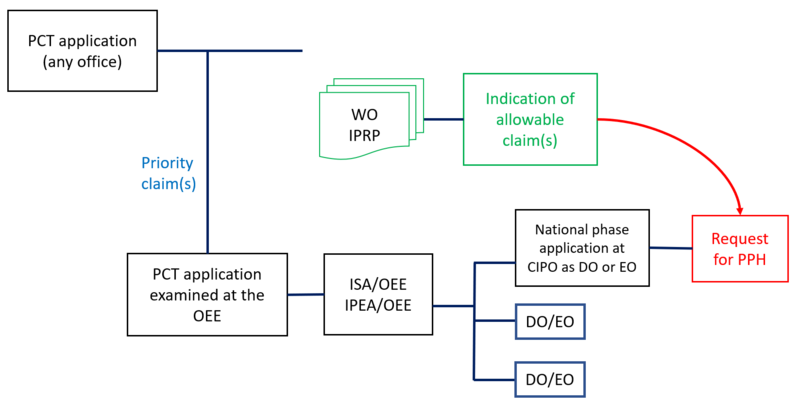 A PPH request is made for the national phase application at CIPO, based on the indication of allowable subject matter in the OEE or the OEE granted patent. Description of Example N A PCT international application is filed and enters national phase at CIPO. CNIPA was the ISA or IPEA for the PCT application and provided an indication of allowable subject matter. A PPH request is made for the national phase application at CIPO, based on the indication of allowable subject matter in the PCT international application. Description of Example N' A PCT international application is filed and enters national phase at CIPO. The PCT application validly claims priority from a national application filed at any office. CNIPA was the ISA or IPEA for the PCT application and provided an indication of allowable subject matter. A PPH request is made for the national phase application at CIPO, based on the indication of allowable subject matter in the PCT international application. Description of Example N" A PCT international application is filed and enters national phase at CIPO. The PCT application validly claims priority from a PCT international application filed at any office. CNIPA was the ISA or IPEA for the PCT application and provided an indication of allowable subject matter. A PPH request is made for the national phase application at CIPO, based on the indication of allowable subject matter in the PCT international application. 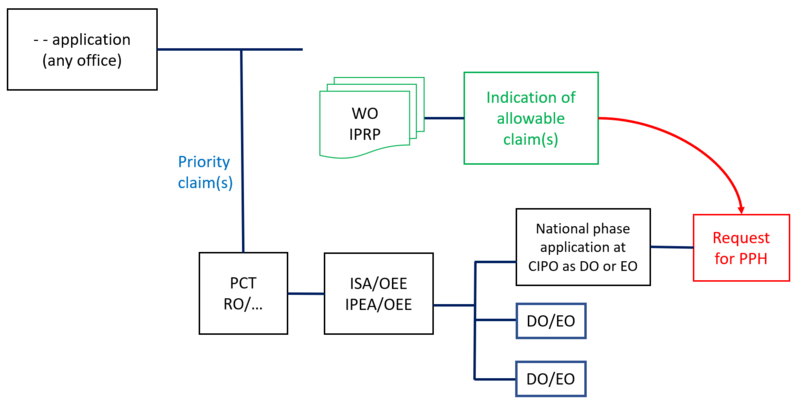 Description of Example O A PCT international application validly claims priority from a CIPO national application. CNIPA was the ISA or IPEA for the PCT application and provided an indication of allowable subject matter. A PPH request is made for the CIPO national application, based on the indication of allowable subject matter in the PCT international application. Description of Example P A PCT international application is filed at any office and enters national phase at CIPO. The PCT application validly claims priority from a previously filed PCT international application filed at any office. CNIPA was the ISA or IPEA for the previously filed PCT application filed at any office and provided an indication of allowable subject matter. A PPH request is made for the national phase application at CIPO, based on the indication of allowable subject matter in the PCT international application. Description of Example Q A nationally filed application at CIPO validly claims priority under the Paris Convention from a PCT international application filed at any office. CNIPA was the ISA or IPEA for the PCT application and provided an indication of allowable subject matter. A PPH request is made for the CIPO national application, based on the indication of allowable subject matter in the PCT international application. Description of Example R The application is a divisional application of an application which satisfies the scenario in Examples N, N' and N". A PPH request is made for the divisional application, based on the indication of allowable subject matter in the PCT international application. Description of Example S The application is an application claiming internal priority from an application which satisfies the scenario in Example O. A PPH request is made for the application claiming internal priority, based on the indication of allowable subject matter in the PCT international application. CNIPA does not need to be the receiving Office for these work products to be eligible.